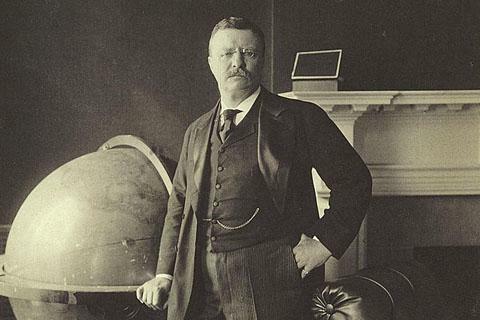 Theodore Roosevelt was president of the United States during the early years of the twentieth century. He was a forceful leader. His national policies led to social reforms and federal protection of nature. His foreign policy led to greater American involvement in world events. On inauguration day, Roosevelt made a short speech. He said America's capitalist economic system had done much good for the country. But it also had created a crisis in social relations. And the crisis had to be solved. "If we fail," Roosevelt said, "the cause of self-government throughout the world will suffer greatly." HARRY MONROE: During his new term in office, President Roosevelt was able to get Congress to approve two major new laws. One was the Hepburn Act. This law gave the Interstate Commerce Commission power to limit how much railroads could charge for transporting goods. The purpose was to keep the cost of railroad transportation reasonable. The other new law was the Pure Food and Drug Act. This law declared it illegal to make or sell foods and medicines containing harmful chemicals. The purpose was to protect the health of all Americans. KAY GALLANT: President Roosevelt's most important foreign policy success came as a result of a war between Russia and Japan. At that time, Russia occupied Manchuria in northern China. Japan occupied Korea. Japan wanted control of Manchuria. It needed that area's coal and iron ore. Japan also wanted to end any Russian threat to Korea. So, it decided to fight. 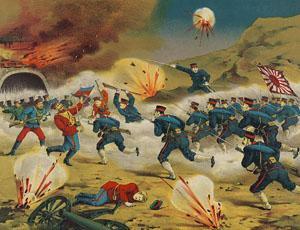 Japan's navy easily defeated all the Russian fleets sent to the Pacific. But the two sides continued to fight on land. When both began to run out of money, they accepted President Roosevelt's offer to make peace. HARRY MONROE: Roosevelt invited Japanese and Russian diplomats to meet with him in Portsmouth, New Hampshire. He told them his greatest hope and prayer was for them to find a just and lasting peace quickly. A quick settlement, however, was not easy. Japan demanded six hundred million dollars for war damages. It also wanted Sakhalin Island. Russia rejected both demands. It had agreed to give up southern Manchuria. Russia would give up nothing else. Negotiations lasted many days. President Roosevelt became more and more angry when neither side would compromise. But he remained calm and kept the talks going. Later, he said: "What I really wanted to do was give an angry shout, jump up, and knock their heads together." KAY GALLANT: Finally, Roosevelt made a secret appeal to the Emperor of Japan. He asked the Emperor to drop demands for money and for Sakhalin Island. He warned that Russia was ready to fight again if the peace talks failed. The Emperor agreed to drop the demand for money. But, he still demanded half of Sakhalin Island. Russia agreed to this compromise. The two sides signed a peace treaty. HARRY MONROE: Theodore Roosevelt received the Nobel Peace Prize for negotiating an end to the Russian-Japanese war. However, his efforts were denounced in Japan. Roosevelt was held responsible for the loss of war damage payments. It was money Japan needed badly. Anti-American riots broke out in some parts of the country. At the same time, tense relations developed between American citizens and Japanese immigrants in California. Poor Japanese immigrants were willing to work for low pay. As a result, Americans lost jobs. They protested. Then school officials in San Francisco barred Japanese children from attending school with white children. President Roosevelt opposed the decision. He asked the officials to lift the ban. In exchange, he agreed to ask Japan to stop its poor farmers and laborers from going to live in America. Japan said it would. The understanding became known as the Gentleman's Agreement. KAY GALLANT: Roosevelt worked hard to improve America's relations with Japan. Yet he made clear that the United States would defend its interests in Asia and the Pacific. As a warning, he sent a naval force on a voyage around the world. The force included sixteen battleships and twelve thousand men. It was called the Great White Fleet. The voyage lasted fourteen months. The fleet sailed down the Atlantic coast of South America. It went around the bottom of South America into the Pacific Ocean, then on to Hawaii, Australia, and Japan. Surprisingly, it received its warmest welcome in Japan. An American reporter said: "The fleet made a deep and far-reaching impression. It caused the Japanese to understand the great power of the United States, as nothing else could possibly have done." 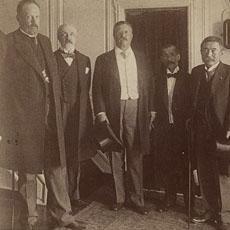 President Roosevelt believed this show of American strength prevented war with Japan. "Sending out the fleet," he said, "was the most important thing I did for peace." HARRY MONROE: Theodore Roosevelt greatly enjoyed playing the part of peace-maker. After successfully ending the war between Russia and Japan, he was asked to settle another international dispute. 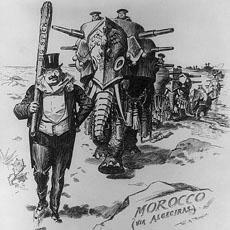 At issue was control over Morocco. that time, the USA made a great contribution for the world peace ,settled sereval international disputs.